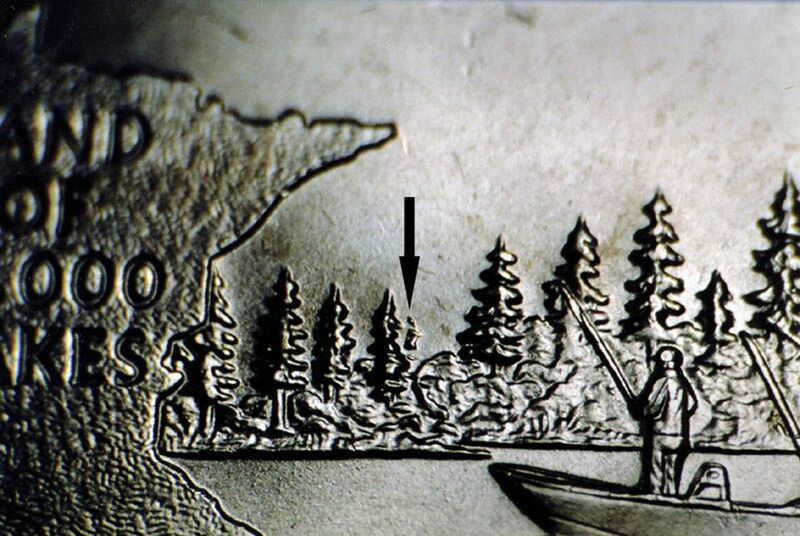 Minnesota "Extra Tree" State Quarter Errors Abound! While Minnesota is known as the "Land of 10,000 Lakes," its State Quarter may be on its way to becoming the "Quarter With 10,000 Die Varieties!" So far, there are at least 54 different reverse variety types noted for the Philadelphia Mint's issue of the 2005 Minnesota State Quarter! In addition, at least 6 different reverse types have been found for the Denver coins, and 4 types for the San Francisco Proof coins, as collectors broaden their search for these profitable varieties. Specimens of the strongest examples of these Minnesota Extra Tree Quarters have sold in the $100 to $200 range, with a slabbed Denver MS-67 example bringing nearly $800 on eBay recently! Unfortunately, most of these die variety error coins cannot be recognized with the naked eye. Therefore, a magnifying glass or loupe must be used. First, turn the coin over to its reverse and put it under a quality light. Using your magnifying glass or loupe, look at the area near the center of the coin. You will notice that there is a boat positioned in front of a line of trees. Just to the right of the outline of the state of Minnesota, there are three trees with the rightmost tree being the smallest one. Look in the area just to the right of the smallest tree to see if there are a small series of lumps. If so, then this is one of the "Extra Tree" die variety coins. In addition to the Minnesota State quarter die variety described above, there are several other varieties that exist. In order to recognize these you will also need a magnifying glass or loupe and a quality light. Another popular variety of this coin is where there appears to be another tree between the smallest tree near the center of the coin and the next largest tree positioned on top of the rocks. On a normal coin this area should be blank and not have an additional tree. The most difficult doubled die error to recognize is the doubling of individual trees. For example, if you inspect the smallest tree near the center of the coin and it appears to have a shadow to the right side of the tree, this is also considered a doubled die coins. Additionally, look at all the trees to see if any of them have what appears to be shadows. As if all of these reverse varieties aren't enough, an obverse "doubled ear" variety has recently been reported from the Philadelphia Mint, according to error and variety coin specialist Ken Potter. Ken lists all of the known Minnesota State Quarter varieties, including his awesome close-up photos of each type, on his Web page devoted to the Minnesota Quarter. Before checking out the exhaustive list, however, take a moment to read the article he wrote regarding the discovery of this type and what kind of variety type we have with the Minnesota Extra Tree Quarters.